TAKING BACK SUNDAY • COREY TAYLOR of SLIPKNOT and STONE SOUR HALESTORM • PVRIS • TYLER CARTER of ISSUES • BLACK VEIL BRIDES MOTIONLESS IN WHITE and many more to be announced! The Journeys Alternative Press Music Awards, fueled by Monster Energy Drink, has added even more performers and presenters, in addition to this year’s official red carpet hosts and esteemed recipients of the Vanguard and Icon Awards. 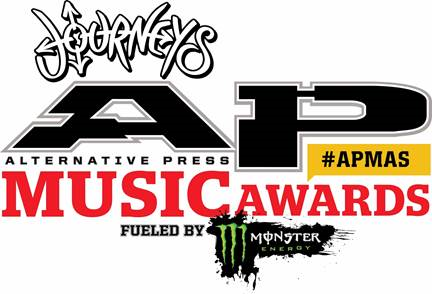 The APMAs will take place on July 22, 2015 at the Quicken Loans Arena in Cleveland, Ohio. The APMAs is pleased to present the revered Vanguard Award to hard-rock legend and respected filmmaker Rob Zombie. As a rock icon and filmmaker with a unique vision, Zombie has continuously challenged audiences as he stretches the boundaries of both music and film. He has sold more than 15 million albums worldwide and is the only artist to experience unprecedented success in both music and film as the writer/director of six feature films with a worldwide gross totaling more than $150 million. The APMAs is very excited to reveal this year’s energetic AXS TV Red Carpet hosts: Every Time I Die’s wisecracking frontman Keith Buckley and New Years Day’s striking frontwoman Ash Costello. The pair will interview many of this year’s stars as they make their way down the red carpet and into the main event. Gibson Brands is also returning as one of the main sponsors of the APMAs and will be hosting the official Gibson Backstage Artist Lounge. All performers, presenters, honorees and award winners will gather at the Lounge for their post-stage victory interviews. Additionally, the APMAs is pleased to announce Tumblr as an official partner. Tumblr is a media network powered by an army of independent creators and home to an audience of more than 460 million unique visitors. This year, the APMAs launched the first-ever “Tumblr Fandom Of The Year” award. Every day, thousands of fandoms post artwork, GIFs, funny memes and so much more on their Tumblr pages, and these nominees were among the most posted about last year. The nominees were chosen via Tumblr’s Fandometrics, and AP staff choices. You can vote for your favorite/the most creative fandom at altpress.tumblr.com through July 6. In addition, to the “Tumblr Fandom Of The Year” award there will be a GIF booth backstage capturing all the exclusive behind the scenes moments from award winners, performers and talent associated with the show. Follow the night’s mayhem on AP’s Tumblr blog. AP cover stars Pierce The Veil are the latest performer addition to this year’s APMAs! PTV have become one of the fastest-rising and most compelling forces on the music scene today, manifested by the rocket-ride success of the band’s 2012 release, Collide With The Sky. The album has sold nearly 300,000 copies in the U.S. alone, and features the single “King For A Day” which has been certified Gold and has racked up an astounding 50 million YouTube views. At last year’s APMAs, the band won three awards, including Best Live Band. Additional live performances include Weezer, Panic! At The Disco, All Time Low, Sum 41, a special performance from New Found Glory featuring Hayley Williams, Rob Zombie, X, DMC of Run DMC, Mike Herrera of MxPx, Taking Back Sunday, Corey Taylor of Slipknot and Stone Sour, Halestorm, a special performance featuring four-time nominees PVRIS and Issues frontman Tyler Carter, Black Veil Brides, Simple Plan and Motionless In White. The world-renowned Contemporary Youth Orchestra will also return to the APMAs to accompany many of the evening’s performances. New presenters this year include members of the Amity Affliction, Asking Alexandria, Beartooth, Crossfaith, Drama Club, Every Time I Die, Man Overboard, Major League, Memphis May Fire, Metro Station, Miss May I, Neck Deep, Never Shout Never, New Politics, New Years Day, Silverstein, State Champs and We Came As Romans. Additional appearances will be made by members of ‘68, As It Is, August Burns Red, Bullet For My Valentine, Mayday Parade, Motion City Soundtrack, Parkway Drive, Real Friends, Senses Fail, Set It Off, This Wild Life and While She Sleeps with more to be announced soon. Voting on all awards is open now via www.altpress.com/apmas, in addition to the Best Music Video award, which can be voted upon exclusively at any Journeys retail location via voter mobile device and store-provided QR codes or via journeys.com/bestmusicvideo. Voting ends on July 6, 2015. View this year’s CATEGORIES and NOMINEES here! APMAs Early Bird discount tickets and Ultimate Monster Travel Packages are already sold out, but you can still purchase several other ticketing options now. Available options include reserved seats at $59.99, premium seats at $79.99, Vans Warped Tour bundles for $89.99, general admission pit passes for $199.99 (which now include early entry) and special VIP packages are $249.99. Head to www.altpress.com/apmas for all ticket offerings and details on each option listed above. The APMAs is very pleased to team with 2015 title sponsor and official retail partner Journeys, in addition to lead presenting sponsor Monster Energy Drink. The APMAs is once again proud to team with official broadcast partner AXS TV. Last year’s award show marked the highest social engagement in the channel’s history. The APMAs is made possible by many other great sponsors and partnerships including Affliction Clothing, AKT, Another Century Records, Artery Recordings, CreativeLive, Disc Makers, DW Drums, Eagle Rock Entertainment, EarthQuaker Devices, Epitaph Records, Equal Vision Records, Fueled By Ramen, Full Sail University, Fearless Records, Hopeless Records, idobi radio, Lace Pickups, Macbeth, MerchNow, Razor & Tie Records, Rise Records, Roadrunner Records, Splat! Hair Care, Sumerian Records, Tumblr, Victory Records and the Rock And Roll Hall Of Fame And Museum. As previously announced, Alternative Press Magazine will be honored by the Rock And Roll Hall Of Fame And Museum with the unveiling of a special new exhibit, Never Give Up: Alternative Press Magazine At 30, presented by Roadrunner Records, Fueled By Ramen and Jakprints. The exhibit opening will kick-off with a special Sonic Session featuring Danish alt-rock group New Politics and one of AP’s “100 Bands You Need to Know In 2015,” Vinyl Theatre. The exhibit opens on the eve of the APMAs, July 21st. For more information and in-depth details about the exhibit, visit www.rockhall.com. The 2015 AP Music Awards is just around the corner! Check back to www.altpress.com/apmas over the coming weeks for more announcements and information. The APMAs is produced by Josh Bernstein, Mike Shea, Kevin Lyman, Dawn Marshman, Joe Scarpelli and Marc Grant. The Museum is open seven days a week from 10 a.m. to 5:30 p.m. On Wednesdays (and Saturdays from Memorial Day through Labor Day), the Museum is open until 9 p.m. Museum admission is $22 for adults, $18 for adult residents of Greater Cleveland, $17 for seniors (65+), $13 for youth (9-12), children under 8 are free. A 6% Admission Tax that goes to support Cleveland Metropolitan Schools is added to each ticket at purchase. Museum Members are always admitted free, for information or to join the membership program call 216.515.8425. For general inquiries, please call 216.781.ROCK (7625) or visit http://www.rockhall.com. The Ohio Arts Council supports the Rock and Roll Hall of Fame with state tax dollars to encourage economic growth, educational excellence and cultural enrichment for all Ohioans. The Museum is also generously funded by Cuyahoga County residents through Cuyahoga Arts and Culture. Gibson Brands recently expanded its reach into consumer markets with the acquisition of Philips’ Home Entertainment based in Hong Kong—a company that invented the cassette tape, the CD format, the DVD format and the MP3 format. Under the Philips and Fidelio brand names, Gibson Brands continue to represent the ideal combination of innovation, tradition and a dedication to improving design while maintaining the highest level o craftsmanship. A global company, Gibson Brands has manufacturing, marketing and research and development centers throughout the world.